Showing results for tags 'how to remove a snagged carp'. 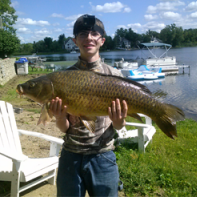 How Do You Romove a Snagged Carp? This has happened to me twice now where I had a huge carp peel off a ton of drag and then doesn't move an inch. They become rock solid and don't move at all. I'm almost 100% certain that the carp just buried themselves in an absurd amount of vegetation because I've heard of this happening before. Unfortunately both carp that did do that I lost. So I was wondering if anyone has any tips or techniques to get carp out of thick weeds. I would greatly appreciate any information.